Tribology is the study of science and engineering of interacting surfaces in relative motion. It includes the study and application of the principles of friction, lubrication and wear. Tribology is a branch of mechanical engineering and materials science. Tribology’s economic and commercial impact is vast. The science reduces energy use, lowers the cost of maintenance and replacement, develops new technology, and solves resource problems, such as the lack of clean water. Proper tribological procedures save an estimated 1.3% to 1.6% of a nation’s gross domestic product—a savings of hundreds of billions of dollars (U.S. currency) in larger countries. Virtually every nation has realized it cannot afford to overlook the economic, industrial, and commercial advantages of tribology. Consequently, tribology is a science that is constantly being advanced by thousands of researchers around the world. Lubrication engineering is the practical application of that science, generally in the development of lubricants and their proper usage and maintenance. STLE, one of the largest professional societies in the field, serves 15,000 industry professionals worldwide. To advance the science of tribology and the practice of lubrication engineering in order to foster innovation, improve the performance of equipment and products, conserve resources and protect the environment. Online webinars, education courses and professional certification programs offer opportunities for continuing education to enhance your career and create value for your company. STLE organizes, supports, co-sponsors and hosts meetings to provide the tribology and lubrication communities an opportunity to network, exchange ideas and information. Educating technical professionals to compete in the global business environment is STLE's core mission of serving as a trusted provider of education and a workforce development partner. STLE honors its 75th anniversary with a year of celebration. we begin with a salute to our founding fathers - a group of people who embody the spirit of volunteerism. STLE Learning Pathways is a new online resource library for lubrication industry professionals to help identify, align and target their education and career development needs with access to technical articles, courses, webinars and books that will help them better serve their customers and employers. The Trends in Tribology and Lubrication Engineering: Industry Leader Predictions Report evaluates the impact of changes in industry, technology and the economy on the field. 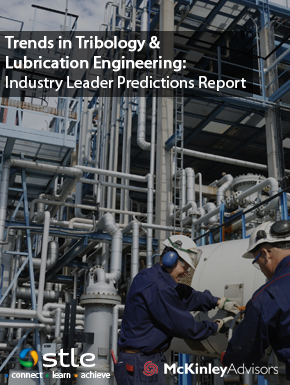 The 20-page report is based on a year-long study of nearly 1,000 industry experts surveyed with the goal of tapping into their collective wisdom and insight and drawing conclusions about the future of tribology and lubrication engineering. On behalf of all STLE members, I’d like to salute our founding fathers on this milestone anniversary. The seed they planted grew into a technical organization that has led the lubricants industry for seven decades and advanced the careers of thousands of members. STLE’s standing in the lubricants industry is so strong that simply being a member confers instant credibility upon an individual and his or her organization. Click here to learn more. STLE invites authors to submit abstracts for consideration as podium or poster presentations for the 2019 Tribology Frontiers Conference, Oct. 20-23 in Chicago. Oral presentations require submission of a 150-word abstract as a summary, as well as a one-page extended abstract that will be archived on the STLE website. Poster presenters may submit a traditional 150-word abstract. The submissions deadline extended to April 15, 2019. Click here to submit TFC papers today! The STLE App Challenge is an ongoing contest that asks players to answer tribology and lubrication-related questions. Every Monday, new questions will be posted through the STLE 365 App. Answer questions correctly to gain points. Players with the top three scores at the end of each month will receive a $10 Amazon gift card. In addition, all winners will be entered into a Grand Prize drawing. Learn more about the STLE App Challenge. STLE is currently seeking volunteers from the membership community, with the expertise and skills, to help the Society continue to improve upon its professional and technical resources to those in the lubrication field. If you're interested, please complete the STLE Volunteer Interest Form. Click here to view available volunteer opportunities for 2019.